As some of you already know, in December 2012 a monologue I had submitted to BBC was short-listed for the Comedy Monologue for new writers initiative. I was ecstatic but cautious. At the end of April, I received confirmation that my monologue had been accepted – it was now ‘rabbit in the headlights’ time! Flora Napier, our ‘Flo’, had also received word that her monologues had been accepted and was I not lucky? I’m sure it was only with her expertise and connections that this particular novice was able to embrace the situation. In May, I met up with Flora to discuss our suggested timescale. We reckoned for auditions mid May and production in June. Flora had a producer friend and an actress friend who would read for her and also for me if I wanted and this was great but I am at this age where I reckon if you don’t ask you don’t get and I already had a ‘voice’ in mind. With my gran’s words ringing in my ears, I contacted no less than Dorothy Paul’s agent. 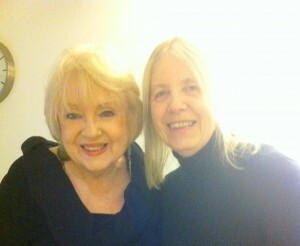 To my amazement, Dorothy very graciously agreed to help ‘a fellow writer’ as long as the recording was in May. Well, May arrived and with it a request from BBC for a spec modification. A budget exemplar arrived and thank heavens once more for Flora who kept her cool – well at least until she couldn’t access the ‘Excel’ document to complete the budget form! May was fast running out and I contacted the BBC as I was worrying about Dorothy’s availability. I was told, ‘Don’t worry, all will be sorted out’, and, ‘the monologue wasn’t being aired until August 2014’, alright for them to say! At the end of May, BBC suggested we used a BBC proposed producer, back to Flora again! Somehow it was agreed that we’d use Flora’s producer friend who now seemed to be sufficiently ‘proposed’. We heard nothing in June and when I left for my 6 weeks in France on 28th I was just a little stressed as I knew I’d have no internet access for that time. On my return in early August, our producer suggested I contact Dorothy Paul once more and ascertain her availability in September. Here we go again! I e-mailed and waited and waited, nothing. I was beginning to think I’d need to contact Flora’s actress friend when on 7th August I received a phone call from DOROTHY PAUL. She was still willing to help me and suggested the week of 16th September for recording. On 13th an e-mail arrived from the producer telling me that the budget had to be ‘re-jigged’ and that Dorothy’s agent had been sent the latest payment offer! On 18th the agent e-mailed to say all was well and that the recording would now be after October as Dorothy was not available till then, but she was still willing to do it! In November the producer informed me that the recording would be in December or January. And so it was that on 6th December I was informed the recording would take place on 13th December, yes, Friday 13th and a year exactly since I was informed that I’d been short-listed. All went well on the day and, although I wasn’t able to go into the recording session, I did meet Dorothy afterwards and she was fantastic, so natural. Flora’s monologues will be recorded in January and the proposed date for airing them all is some time in March so keep listening to the Comedy Monologues on BBC Radio Scotland on Friday afternoons! I’m still pinching myself, there were many highs and lows along the way but I reckon I did aim for the stars and I certainly got one!! What a fantastic roller-coaster of an experience! And we’ve had an insight into the workings of the Beeb. Thanks for sharing the excitement with us. I’m looking forward to hearing the two monologues in spring.